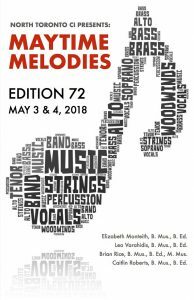 The 72nd edition of Maytime Melodies is May 3 and May 4 at 7pm. using Cash Online (search “Maytime” under TDSB tab) – tickets will be available at the box office on the evening of the concert. Website and Moodle Mail system is down. Currently the NTCI website mail systems are down. The NTparents mailing list and all moodle mail is affected. Report cards were distributed this morning during Home Form periods. Please ask your son or daughter to review the report card package which also includes a program verification form/credit counselling summary which indicates course selection for next year. Leaside School Council invites our school community to a parent workshop promoting a positive body image and information regarding eating disorders lead by Kyla Fox. The workshop takes place Thursday April 19th at 7 pm at Leaside High School (200 Hanna Road in the school library). This is a free event but space is limited. Please apply for tickets at sarahwht”at”aol.com. Tickets will be offered on a first come first served basis. Doors open at 6:30 pm for light refreshments. April 23 – 27: North Toronto celebrates Earth Week with a kick-off assembly on Monday April 23. Topic: In light of the recent police Public Safety alert about robberies at Yonge and Eglinton, the executive committee of the North Toronto School Council has arranged a panel discussion about this issue, the context, the contributing factors and what we can do as a community to help ameliorate matters. We have representatives from Toronto Police Services 53 Division joining us, as well as board, staff and student representatives. Please join us on Wednesday April 25th at 7:30 pm. Cuba Service Trip – a parent information session will be held regarding next year’s school trip to Cuba. Parents are invited to attend the information session on May 9 at 6:30 pm in room 215. Parents are reminded that they are responsible for updating student immunization records with Toronto Public Health. If you child requires a vaccine or an updated immunization record, you would have already been contacted via mail with three information letters from Toronto Public Health (mailed on Nov. 30/17, Feb. 1/18 & Mar. 1/18). Students must submit updated information to Toronto Public Health by Mar. 29/18 or they will face a school suspension until their health records are updated. If you have any questions or concerns, please contact Toronto Public Health directly at 416-338-8460.